Prayers are Groups A & F: (See https://remnantdisciplesjtm.com/crusade-prayer-group-format/ for details). Emmanuel. Again the LORD spoke to Ahaz: 11Ask for a sign from the LORD, your God; let it be deep as Sheol, or high as the sky! 12But Ahaz answered, “I will not ask! I will not tempt the LORD!” 13Then he said: Listen, house of David! Is it not enough that you weary human beings? Must you also weary my God? 14Therefore the Lord himself will give you a sign; the young woman, pregnant and about to bear a son, shall name him Emmanuel.15Curds and honey he will eat so that he may learn to reject evil and choose good; 16 for before the child learns to reject evil and choose good, the land of those two kings whom you dread shall be deserted. 17The LORD shall bring upon you and your people and your father’s house such days as have not come since Ephraim seceded from Judah(the king of Assyria). 18On that day The LORD shall whistle for the fly in the farthest streams of Egypt, and for the bee in the land of Assyria. 19 All of them shall come and settle in the steep ravines and in the rocky clefts,on all thornbushes and in all pastures. 21On that day a man shall keep alive a young cow or a couple of sheep, 22 and from their abundant yield of milk he shall eat curds; curds and honeyshall be the food of all who are left in the land. 23 On that day every place where there were a thousand vines worth a thousand pieces of silver shall become briers and thorns. 24One shall have to go there with bow and arrows, for all the country shall be briers and thorns. 25But as for all the hills which were hoed with a mattock, for fear of briers and thorns you will not go there; they shall become a place for cattle to roam and sheep to trample. Paradise,My daughter, although the rightful home for each and every one of you, is not easy to enter. 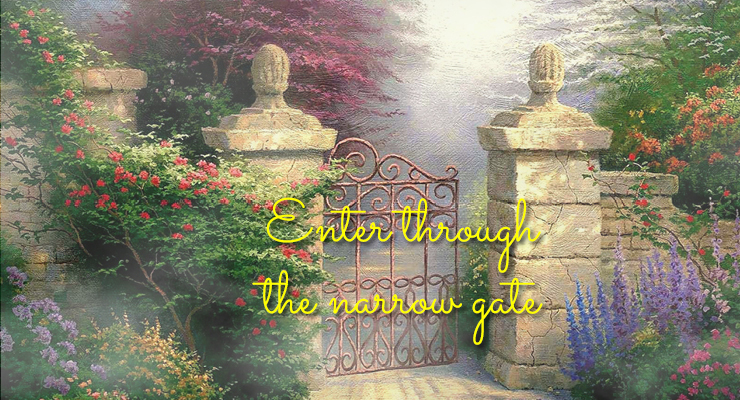 The entrance is small and only so many can enter at a time. In order t o enter, souls must show humility and place themselves fully in My Hands. They must push aside pride, strong will and the eagerness and attachment they have for the material things on this Earth, if they want to enter Heaven. Humility is a term many of My children understand through My Teachings.While many of My followers understand why it is important, they are confused as to what it really entails. Humility means sincerity. It means accepting, with dignity, the trials, challenges and abuses you will find yourselves facing especially when you come in My Name.My best advice is this. Think of yourself as a child, a simple, innocent child, with no knowledge of the evil society that you would normally experience as an adult. Communicate at all times in your prayers to Me through the eyes and the heart of a child. Keep prayers and communication simple. I do not expect you to recite all Prayers handed down, out of Love, to the world. Look up and share your problems with Me. Share your sufferings. Give them over to Me. You will be rewarded greatly when you accept sorrow or suffering in your lives, for Me. You may not realise this, but when you do, you are saving many souls and are paving the way for them to enter Heaven.This fact will not be revealed to you until you too, enter Heaven, where you will experience the glory of your generous gift to Me. Explain the Truth of My Teachings calmly.Do not lose your temper. Do not show fear of the abuser, either.Be firm. Defend yourself, but only by reiterating My Teachings. Never be afraid to speak the Truth openly. Do not confuse humility with cowardice.Some of My followers who understand the importance of humility and its relevance in sanctifying souls, confuse this by staying silent when My Name is mocked in public. Yes, you should never judge the person who ridicules Me,or My Eternal Father, or indeed, My beloved Blessed Mother, but you should stand your ground in defense of the Truth. In time, My children, all these graceful actions will make sense. Pray every day for the strength to live your life in My Name.Know that every time you forgive another, although he may seem like the enemy, you expand My Heart of Love and Mercy. For that, you will receive eternal happiness in Heaven. My child, you must devote all your prayers, now, for those lost souls who will not acknowledge the Existence of God. Scattered throughout the world, those poor souls are living through a time when they are tormented with lies. Those lies are planted in their hearts by the deceiver. Without the Light of God in their hearts, they have nothing to look forward to. They do not honour God, so, instead, they try to find a replacement. The replacement usually takes the form of idolatry for other people, or for material things. All that they receive, at the end of their quest for peace, is turmoil and confusion. They will never find peace, without loving God. My beloved Father, through the Mercy of His Son, Jesus Christ, pours out His Light and Love over such souls. They do not accept these Graces and turn their backs on the only way they have of achieving eternal peace and happiness. You must pray for all those in high places, with power over your nations, as they suffer, greatly. They are being targeted daily, by the evil one, so that they can be used as a means to inflict hardships on God’s children. Their plan to destroy all traces of God from the lives of the nations they control, is already in place. As they reveal their true intent, they too will become victims, as well as, those souls who will suffer under their regime. Here is a Crusade Prayer, which you must recite to enlighten governments, so that the Grace of God can cover world leaders. pour out His Graces and Love over those leaders who control the world. Pray that the Light of God will cure them of blindness and unlock their hearts of stone. Stop them from inflicting persecution on innocent people. Truth of His Teachings from being spread to nations, throughout the world. Amen.